Temperos Portugueses Portuguese AllSpice 1/2 oz. 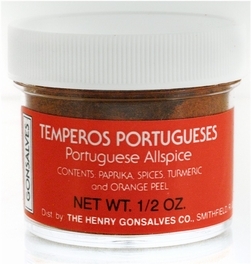 Home Local Favorites Temperos Portugueses Portuguese AllSpice 1/2 oz. Allspice is most commonly used in desserts such as spice cakes, cookies, muffins and breads. Try a sprinkle in apple sauce, fruit compotes or fruit sauces.